In order to identify a novel whitening agent, the methanol extract of S. polyanthum leaf was focused on by the screening test using nine Indonesian medicinal plants for the inhibition of melanogenesis and tyrosinase activity in B16 melanoma cells. Three novel compounds [(1) 1-(2,3,5-trihydroxy-4-methylphenyl)hexane-1-one, (2) 1-(2,3,5-trihydroxy methylphenyl)octane-1-one, and (3) (4E)-1-(2,3,5-trihydroxy-4-methylphenyl)decan-1-one and one known compound [(4) 1-(2,3,5-trihydroxy-4-methylphenyl)decan-1-one were isolated from the methanol extract. 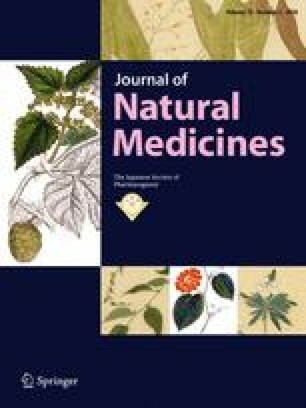 Our study demonstrated that S. polyanthum leaf methanol extract at 25–200 μg/mL decreased extracellular melanin formation ca. 20–80%, with high cell viability. Compounds 1–4 were found to be active in melanogenesis and tyrosinase inhibition. Compound 3 was the most active against tyrosinase activity (83.98 μM), particularly when l-tyrosine was the substrate. Compounds 1–4 significantly diminished extracellular melanin formation in B16 melanoma cells (> 80%), with high cell viability. Thus, our study suggested that compounds 1–4 isolated from the methanol extract of S. polyanthum leaf play important roles in decreasing extracellular melanogenesis and inhibiting tyrosinase.